"wonder if any of the Ns will be preserved" A far more worthy cause then yet another Atlantean..
"I think the PCTPG will definitely preserve one of them at least; they were the first fleet of low floor buses to enter service with PCB"
"And you would want to preserve one of the N reg Darts because ............ They are hardly an iconic vehicle." "I know they aren't anywhere near as special as an Atlantean, however they were the first fleet of low floor vehicles to enter service with PCB. The ones most likely to be preserved are the ones registered on June 7th 1996, rather than the ones registered on July 1st 1996. If that's the case, then the preserved ones would probably be either 1,2,4 or 5; all these were registered on June 7th, 3,7,8,9,10 and 12 were all registered on 01/07/1997"
"Like them or not, The Dennis Dart is responsible for near single-handedly changing the landscape of the entire industry not once, but twice. Firstly by offering a modern and lightweight replacement at precisely the right time for thousands of worn out single deckers, and also capitalising and building upon the gains made by the minibus revolution. Secondly, the Dart SLF was the first example of a truly successful low floor bus in the UK, in not just reliability but also operator and passenger appeal. I'd rate the importance of a Dart over an Atlantean any day.."
I must admit I agree with this last comment. As boring as it is for the enthusiast, you only have to spend a few minutes on Royal Parade to see just how important the low floor Dennis Dart has been to Plymouth. 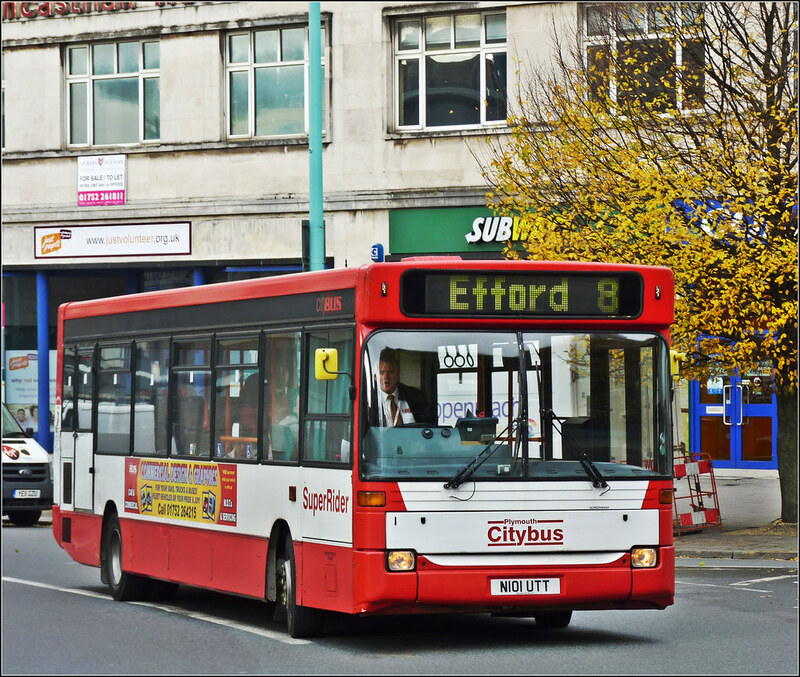 Both Citybus and First have a substantial fleet of them which will no doubt be serving Plymouth for many years to come. I have always preferred the simple lines of this first batch of Low Floor Pointers over the Pointer 2 body which graces the rest of the Citybus fleet. I do hope that one of these buses does make it into preservation, and I guess number 1 is the significant one, if only as a result of its fleet number. It will be interesting to see what fleet numbers are carried by the new Volvos next year. It would be nice to see them start at 101 but we will have to wait and see. Happy Birthday Zak – NINE years old already! There must be plans to start re numbering the complete fleet as the numbers are all over the place now!